in conjunction with the Association of Singapore Marine Industries(ASMI)’s 50th anniversary. The launch event was held at the Trade Association Hub in Jurong Town Hall, where ASMI is located. The Minister who was guest-of-honour at the event, also announced the establishment of an ITM Programme Office within the Association, to drive and support the implementation of the ITM initiatives. The M&OE ITM is developed by a multi-agency team led by the Economic Development Board, together with ASMI, the unions and industry partners, under the M&OE Industry Tripartite Committee. 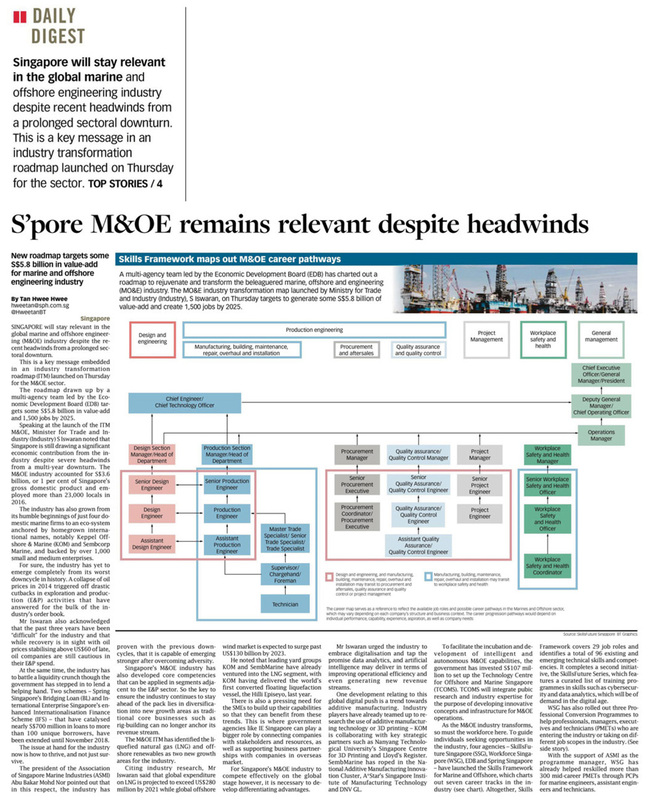 The M&OE sector is one of 23 industries covering 80% of Singapore’s GDP identified by the government under its $4.5 billion Industry Transformation Programme (ITP), where ITMs will be developed to help industries restructure and transform. The ITM is a strategy to promote growth and competitiveness for the industry. Each ITM integrates productivity improvement, jobs and skills development, innovation, and trade and internationalisation. · Equipping Singaporeans with relevant skills. 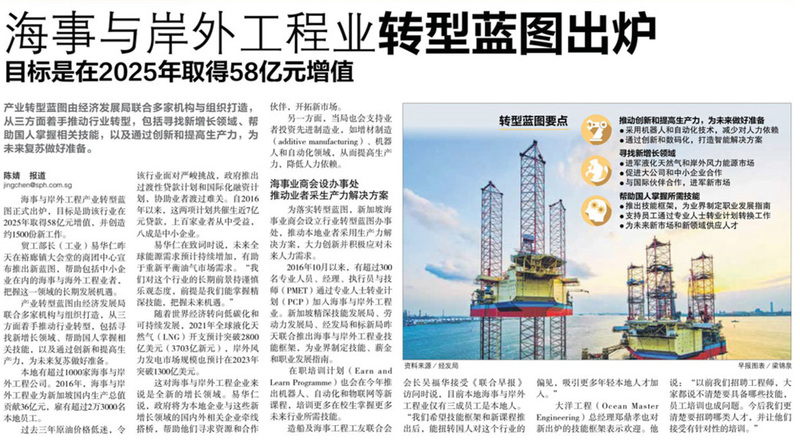 domestic marine firms to more than 1,000 small and medium-sized enterprises today, anchored by world-leading homegrown companies and multinational companies. 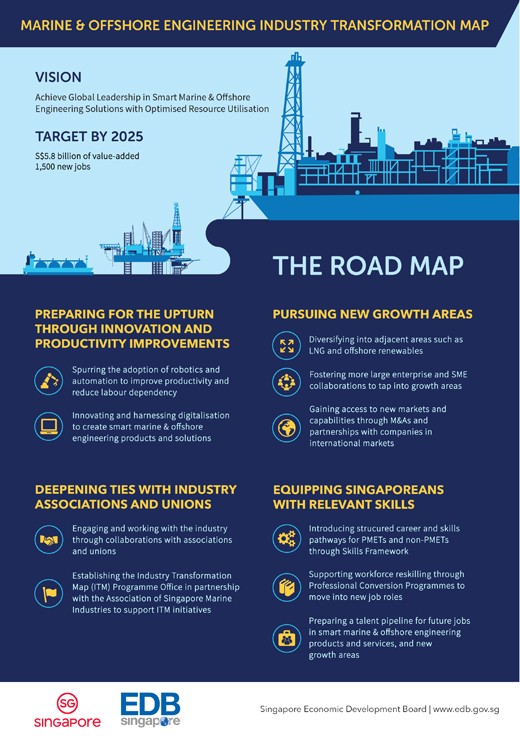 Through the ITM, the M&OE industry is expected to have a value-add of S$5.8 billion and create some 1,500 new jobs by 2025.
as well as innovating and harnessing digitalisation to create smart companies in international markets. 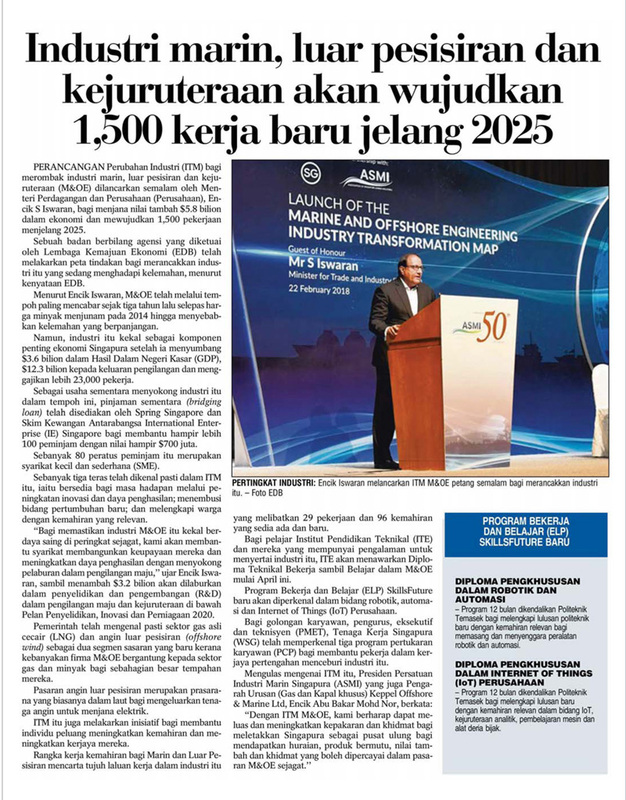 It also includes spurring the adoption of robotics and automation to improve productivity and reduce labour dependency, as well as innovating and harnessing digitalisation to create smart marine and offshore engineering products and solutions. 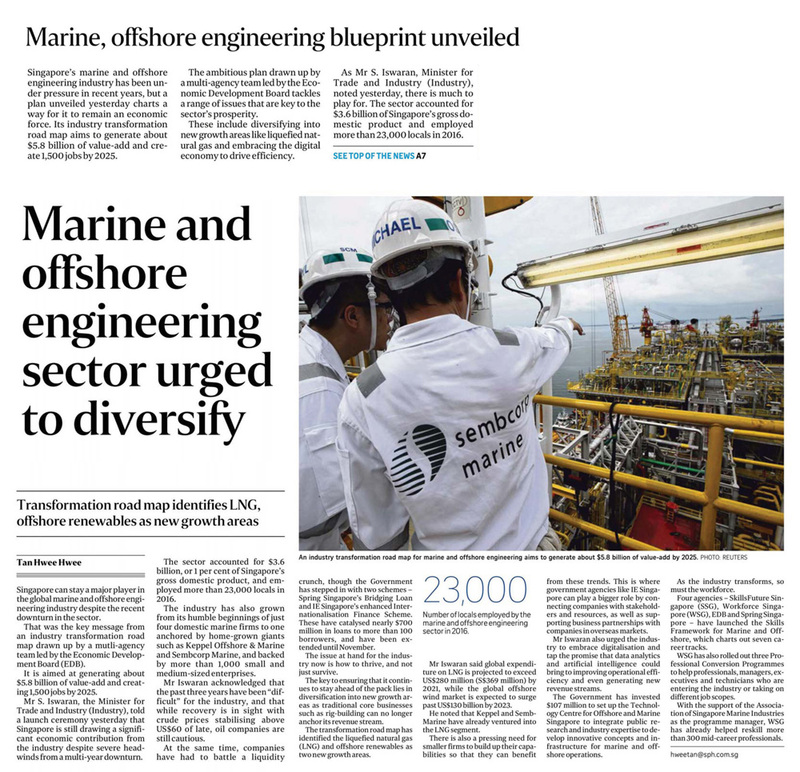 The ITM also introduces structured career and skills pathways for professionals, managers, engineers and technicians (PMETs) and non-PMETs through Skills Framework, supporting workforce reskilling through Professional Conversion Programmes (PCP) to move into new job roles, and preparing a talent pipeline for future jobs in smart marine and offshore engineering products and services, and new growth areas. The ITM Launch also marked the establishment of the M&OE ITM Programme Office in ASMI, with SPRING’s support. The Programme Office will work with companies including SMEs, to drive the adoption of productivity solutions, encourage innovation efforts and address future manpower needs. 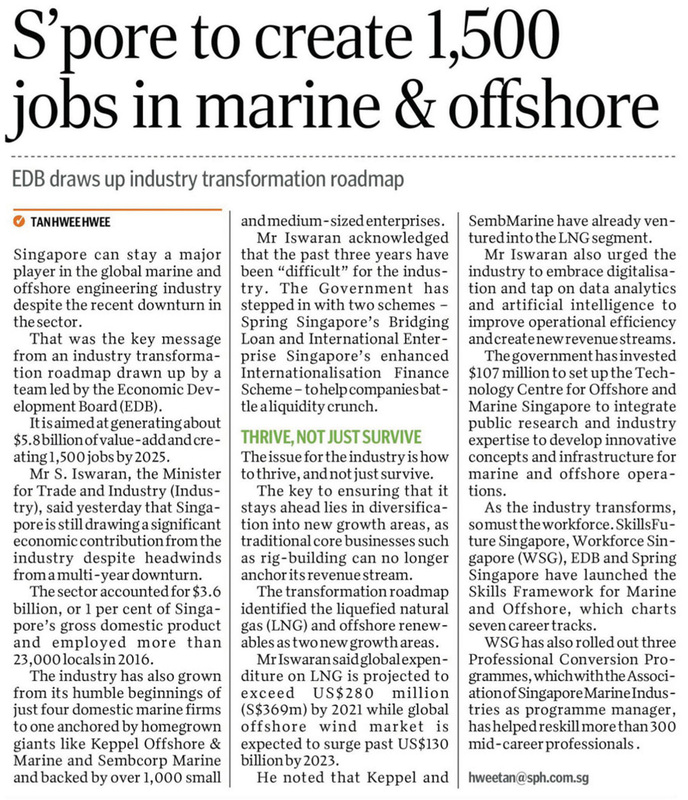 The Marine and Offshore Engineering ITM is one of 23 ITMs developed to address issues and deepen partnerships between Government, firms, industries, trade associations and chambers under the government’s S$4.5 billion Industry Transformation Programme. The Marine and Offshore Engineering ITM is grouped under the Manufacturing cluster, which is one of six clusters that the ITMs are grouped into. Please click here to go to the Marine and Offshore Engineering ITM webpage.